Ashburn, VA, January 30th, 2012 - Telepresence Options, the leading publisher covering telepresence, videoconferencing, and visual collaboration, is announcing the launch of its 2012 sponsor program. 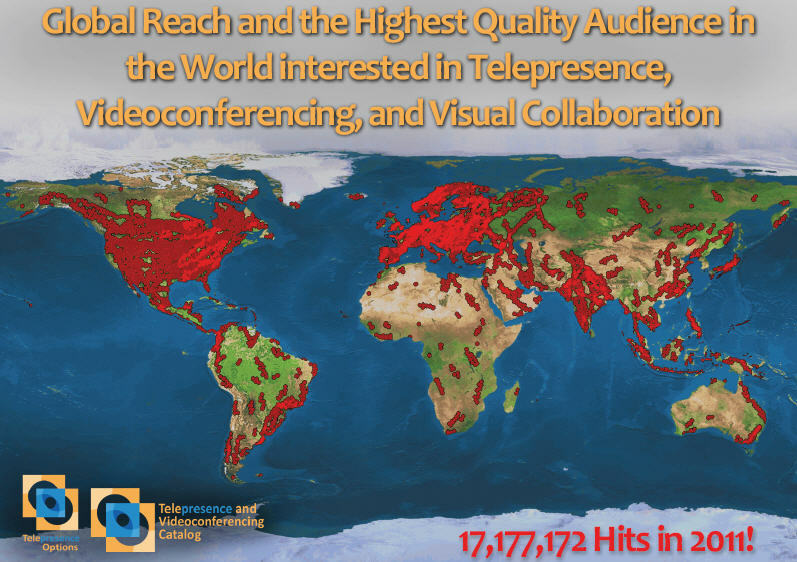 The new program provides access to the largest and highest quality audience in the world interested in telepresence, videoconferencing, and visual collaboration. More Website Visitors! - Over 25,000+ unique visitors a month from 165+ countries. Average daily sessions are running over 2500+ per day from 1906 per day in 2011. More Subscribers! - Newsletter subscribers are over 5500+, Twitter followers are over 3200, and Telepresence Industry Professionals are over 2700! 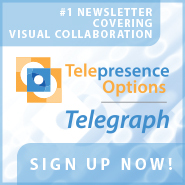 Subscribers to Telepresence Options Magazine have more than doubled! More Distribution! 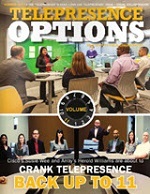 - Telepresence Options Magazine will be distributed in bulk at more end-user events than last year and has twice the snail mail subscribers than last year. More Social Media - In the past year we have added Facebook and Scribd to our Social Media options! Bigger Catalog! - The Telepresence and Videoconferencing Catalog continue to grow... This should be our biggest catalog ever! managed services, and inter-networking solutions for telepresence and visual collaboration. Sponsorship of Telepresence Options will place your company's name in front of tens of thousands of decision makers, influencers, information gatherers, academics, analysts, and others researching their Telepresence Options. Gold Sponsors, Silver Sponsors, and Advertisers in the Telepresence Options 2013 Yearbook receive the ability to place their advertising material in the next edition of Telepresence Options Magazine that remains the most cost-effective and targeted way to distribute your message. The Telepresence Options' website is the #1 destination on the Internet for information on telepresence, visual collaboration, managed services, and inter-networking solutions. The New and Improved Telepresence and Videoconferencing Catalog, is the most comprehensive catalog of telepresence, videoconferencing, and visual collaboration solutions anywhere. We also have a number of other marketing opportunities available including: Banner Advertising, Newsletter Advertising, Video Promotion, White Paper Distribution, and more! Leverage your message across the #1 website, RSS Feed(s), video channels, and newsletter following telepresence, effective visual collaboration, and inter-networking telepresence. Leverage your message across the #1 website, RSS Feed(s), \nvideo channels, and newsletter following telepresence, effective visual \ncollaboration, and inter-networking telepresence.